This section describes how to display a Web form and process form input data in UTF-8. 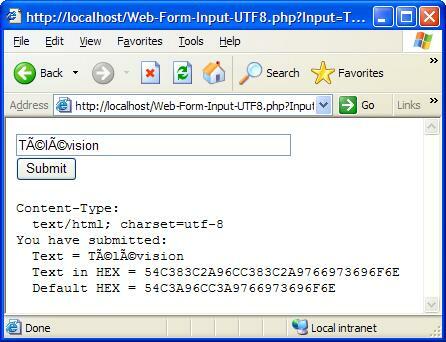 A HTML header tag <meta> is used to set the Web page with charset=utf-8 for UTF-8 encoding. A default input text is provided with a French word in UTF-8 encoding. To avoid any encoding conversion, I used HTML entity format to provide the UTF-8 encoded bytes in Hex values. Note that the special French character is encoded in two bytes. The received text from the $_REQUEST array is displayed back on the returning Web page as encoded characters. It is also displayed in Hex values to compare with the HEX values of the default text. After moving this PHP script file to Apache server document directory, I tested it with Internet Explorer (IE) with this URL: http://localhost/Web-Form-Input-UTF8.php. I saw a Web page with a form that has the suggested input text and a submit button. However, the French characters in the default text encoded in UTF-8 were not displayed correctly. Conclusion: IE can not take UTF-8 byte sequences as Hex values in the format like &#xC3A9.